Learn how to make gulai ayam kampung with Chef Khder Mohsen Al-Issa. 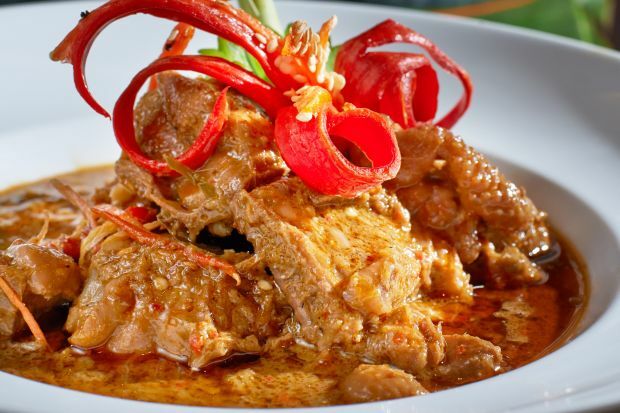 A dish of chicken cooked until tender in rich and creamy gulai sauce. With 15 years of experience under his belt, the culinary journey of Syrian-born Chef began with his restaurateur father. Now the Chef de Cuisine at Fuzion restaurant, Sunway Resort Hotel and Spa, Khder has a passion for his Middle Eastern roots, specializing in Syrian, Lebanese and Moroccan cuisine. Blend the chilli paste ingredients together. Pre-heat oil and stir-fry the chilli paste. Add the spices and stir-fry until fragrant. Add the chicken, cover and bring to boil. Cook for about 35 minutes on low heat until chicken is tender. Let the concoction boil for 2-3 minutes.